One of the most useful features of the PRO version is the Mark as paid one. This tutorial will guide you through how you can mark authors and posts as paid with Post Pay Counter, and how to use the plugin to pay authors through PayPal in just a few clicks. Marking as paid is useful especially because it allows for automated payment managing! You will not need to take care of how much you paid an author last month and how much you should pay him this month. The plugin will keep a payment history and will make all the math needed. First thing you need to care about is permissions. Post Pay Counter has detailed permissions settings to keep users from accessing features they should not. You yourself may not yet have access to payment features because you lack permissions to do so. 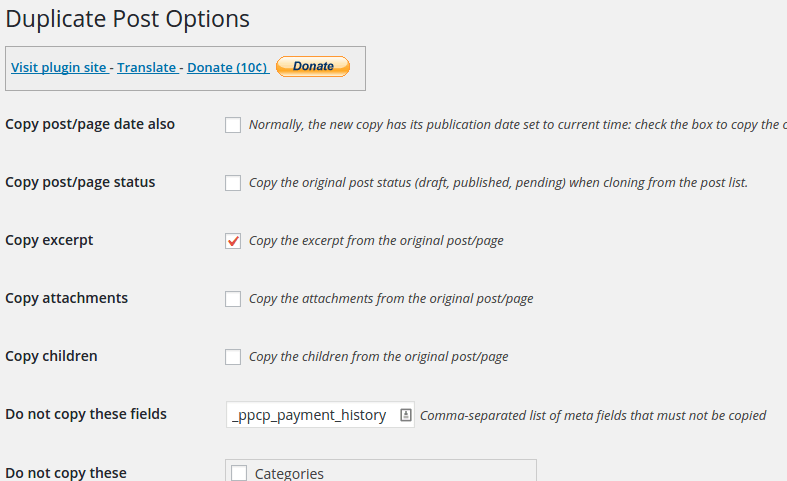 Head over to Post Pay Counter > Options and look for the Permissions box. Let’s start by ticking all payment-related permissions. Of course, you can play around with them and decide exactly which you want to be active, but we are going to present all the available features now. When your setup will be complete, you may want to personalize user settings in order to hide those features from normal users and only see them yourself. Payments happen in the stats page, so let’s go to Post Pay Counter > Stats now. 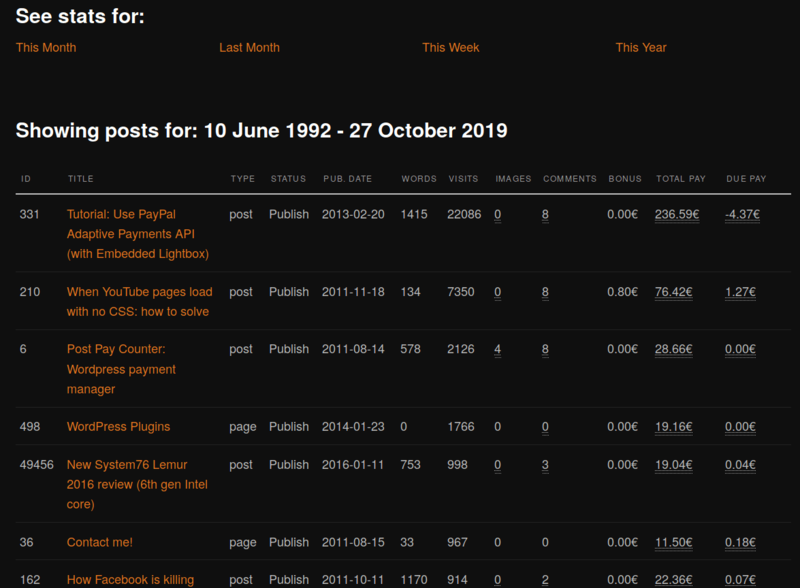 Payment features are available both in the general stats view (where authors are displayed) and in the detailed stats view (where posts details from a single author are displayed). We will be showing them off for the detailed view of a specific author now. Post Pay Counter PRO allows you to pay your writers on WordPress basing on how many Google Analytics visits their posts logged. This tutorial shows how to set it up. After setting it up, you may be interested in putting up an effective visits payment flow. Note: Post Pay Counter PRO does not keep track of Analytics visits, it can only use them to compute the payments. 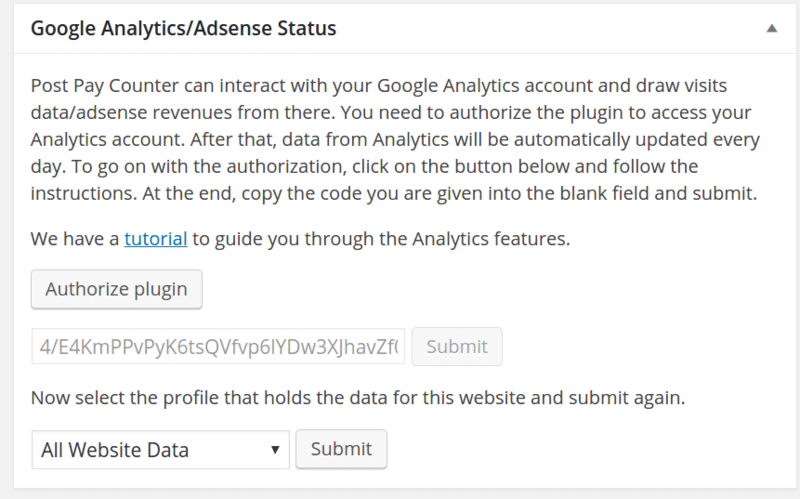 For the tracking you will need something like Google Analytics for WordPress. First thing to look for is the Google Analytics Settings box. Every section is explained quite in detail, but what is important is that you go through these settings before going on with the setup. They are already set up in a standard and usually-fine way, but if you do want to change them, you should do that before anything else. Don’t forget to hit the Save options button when you are done. More and more websites are paying users with a share of the Adsense revenues their posts generate: Post Pay Counter PRO now allows you to automatically get the total Adsense revenue for each post, calculate the share due to an author, and display all data in a nice stats table, ready for payment and record storing. Authors don’t have to provide their Adsense code, nor they need to even have one. In fact, all revenues go into the site admin account, and Post Pay Counter will split with the authors the revenue generated only on the posts that they have written. Let’s get started to see how sharing Adsense revenues in WordPress works. One of the most appreciated features of Post Pay Counter PRO is the shortcode, which provides the ability to display the statistics and payment details in public pages. The stats table will use your theme’s style and will be thus seamlessly integrated with the look of your site. This allows your users to see stats without having to access the admin section. This is useful when users are not supposed to ever access wp-admin, neither for writing posts nor for any other matter. In this way, they will not need to access wp-admin to see their earnings and to interact with the plugin. The shortcode is [ppc]. If you use it as it is, with no parameters, the default stats page will be shown: general stats with a time range which is the default one set in Options > Misc settings > Default stats time range. This is what you would see if you just went to the wp-admin Stats page. Post Pay Counter PRO does not only compute payments on your WordPress blog, but it allows you to pay your writers without having to manually head to PayPal’s website and enter the amounts and emails. Up to 6 users can be paid at a time, each transaction needs to be explicitly authorized before it is completed (works just like a Checkout page), currency conversion is supported and it is possible to choose whom pays the PayPal fees, either the admin (sender) or the users (receivers). The plugin works with the Adaptive Payments API, if you ever wanted to know. This tutorial will walk you through setting up PayPal with the plugin. If you want to know how to actually pay authors, see this other tutorial. To know how users can enter their PayPal addresses, see this tutorial. If you already know how to pay your writers per visits, you may want to pay them for all the visits their posts record through all time, not just for the current month. This can be easily achieved through the PRO version mark as paid feature. This tutorial will guide you through how to set up the payment flow in order to achieve that. If you use Google Analytics, make sure you have selected the desired start day for visits. This can be done through the Update Analytics Data feature in the Google Analytics Status box. For example, if you want to pay writers for views since the beginning of 2016, then you need to select 2016/01/01. You may well want to start counting visits since the day you install the plugin, in which case just select that day or don’t do anything. Post Pay Counter PRO allows to pay authors through PayPal with ease. However, users must enter the PayPal email address which they would like to be paid to, for the feature to work. There are several ways in which you can make them do that. The user profile page is the easiest place in which they can set their PayPal email address, just as any other profile settings. The feature is enabled by default and you need to take no action. However, this requires that authors have access to wp-admin, at least for profile editing, which they may not depending on your setup. The PRO version comes with several shortcodes for stats. It also ships a shortcode to display the PayPal email address form in any public page of your choice. You just need to create a new page, enter [ppc_user_paypal_email_settings] as text and publish it. Logged-in users visiting that page will see the apt field to enter and change their PayPal email address. When linking Google Analytics with Post Pay Counter PRO, you need to select which of your profiles relates to the site you are using. However, sometimes you don’t see your website name, but only a cryptic All Website Data. If you have multiple profiles to choose from, it’s virtually impossible to know which one you should pick. This is not an issue of the plugin, but a misconfiguration in Analytics. In this tutorial you’ll learn to change the label so that it carries your website name. What is the meta key for the user_meta PayPal email address? The user’s PayPal email address is stored as a WordPress user_meta with the meta_key wp_ppcp_paypal_email. Note: if you changed the default WP table prefix, the meta_key should be changed to yourprefix_ppcp_paypal_email. Posts which you have never marked as paid show up as already paid, making the author balance incorrect (or even negative). This problem probably happens because you use a duplicate post plugin: when you duplicate a post, depending on your settings, even the post custom fields could be copied. Post Pay Counter payment history is stored in a (hidden from editor) custom field, so that if you duplicate a post, even the payment history gets copied. 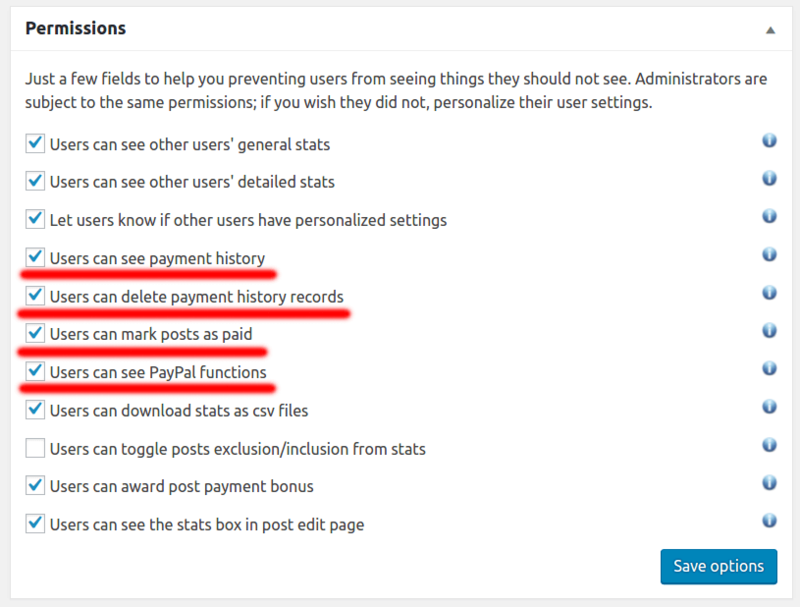 To prevent this, you need to edit the duplicate post plugin settings, adding to the fields exclusion list _ppcp_payment_history. In the following screenshot you see how Duplicate Post should be set up (look at the bottom field, under Do not copy these fields). 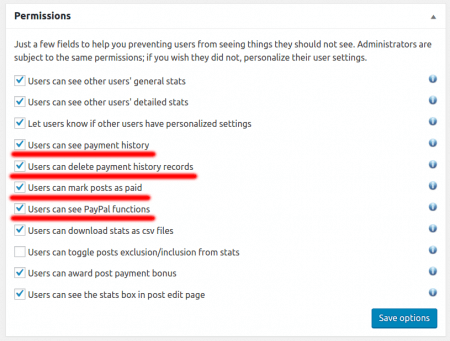 To fix the issue for existing posts, you need to delete/overwrite the _ppcp_payment_history meta. This will most likely require direct database access or an advanced custom field editor.